For those of you that prefer to feed whole grains to your chickens, we have a new organic feed that is 50% pellets and 50% whole grains. 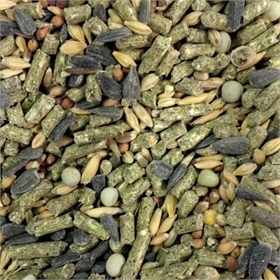 This protein layer mix combines (16% alfalfa) pellets with whole grains that include: wheat, peas, red milo, barley, oats, and black oil sunflower seeds. Your hens will love it! Organic Stabilized Rice Bran, Organic Wheat, Organic Barley, Organic Peas, Organic Milo, Ground Limestone, Organic Sunflower Seed, Sun-dried Alfalfa, Organic Oats, Organic Flaxseed, Organic Monocalcium Phosphate, Diatomaceous Earth, Organic Kelp Meal, Hydrated Sodium Calcium Aluminosilicate, Hydrated Sodium Aluminosilicate, Salt, DL-Methionine, Organic Flavors(Garlic, Horseradish, Anise Oil, Juniper Berries Oil), Choline Chloride, Extracted Citric Acid Presscake, Ferrous Sulfate, Manganous Oxide, Dehydrated Aspergillus Niger Fermentation Product, Zinc Oxide, Niacin Supplement, Copper Sulfate, Sodium Selenite, dalpha Tocopheryl Acetate, Calcium Pantothenate, Biotin, Vitamin A Supplement, Vitamin D3 Supplement, Riboflavin Supplement, Pyridoxine Hydrochloride, Menadione Nicotinamide Bisulfite, Vitamin B12 Supplement, Ethylenediamine Dihydriodide, Folic Acid.